It is exciting to be celebrating the First Anniversary of the newly restored Havre de Grace Cultural Center by sharing a number of items from our shop and our Havre de Grace history collection for their display. 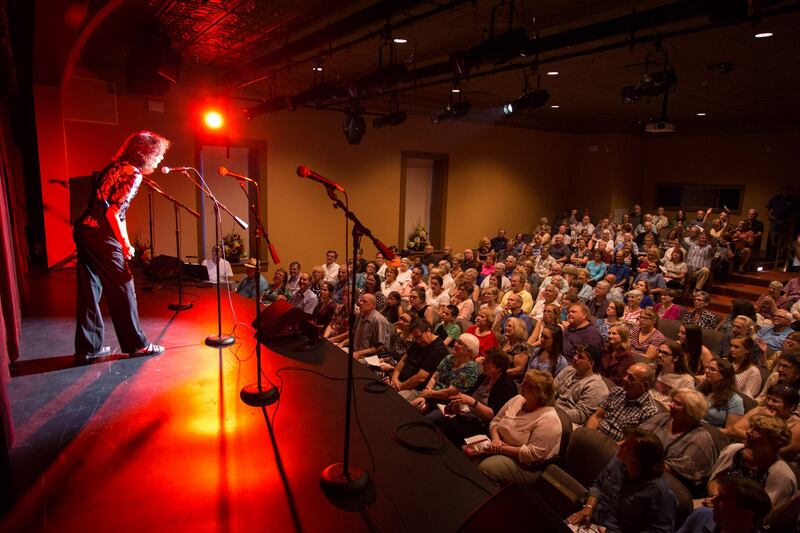 Offering hundreds of programs for the youngest to the oldest citizens of our city and to residents and visitors alike, the HdG Opera House is a beacon to creatives. If you’ve not visited the Opera House yet, this weekend rounds out a week of celebration. CLICK HERE to see what’s happening and to purchase your tickets for their weekend celebrations and upcoming events. Havre de Grace has the energy of the arts running in its veins. 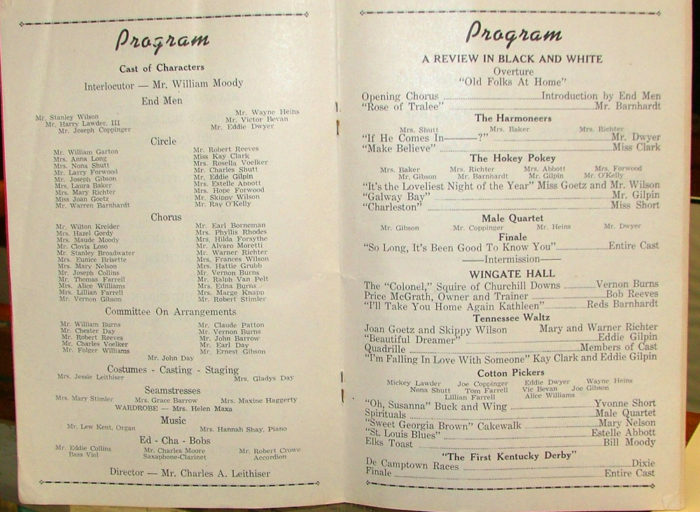 From early days of minstrel shows and theater on a barge to today’s Tidewater Players (our local community theater group), performing on stages continues to be alive and well. The beautifully restored HdG Opera House! 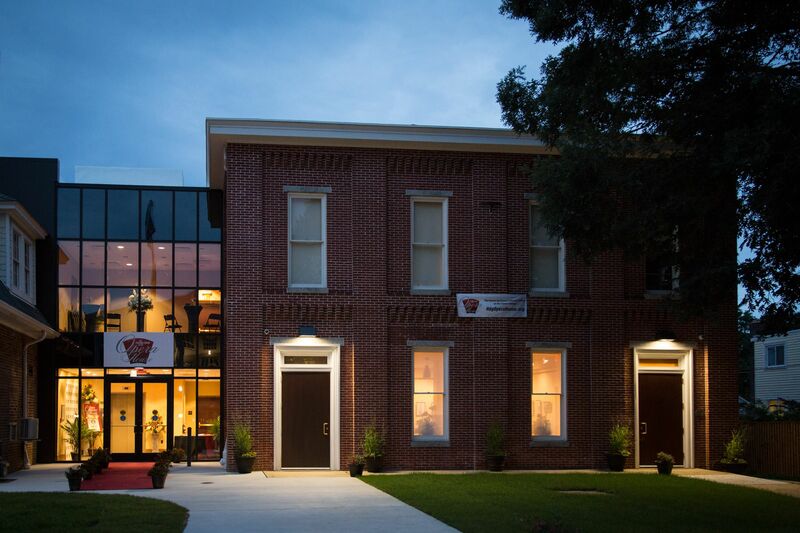 Visit the Havre de Grace Opera House at 121 N. Union Avenue. You’ll not only find wonderful performances, but there is also a wall of interesting historical photos and memorabilia sharing the history of the building itself and theater in Havre de Grace. Day 31 We Talk OYSTERS! In our area, oysters are popular. An oyster platter is an appreciated gift – possibly a perfect hostess gift! 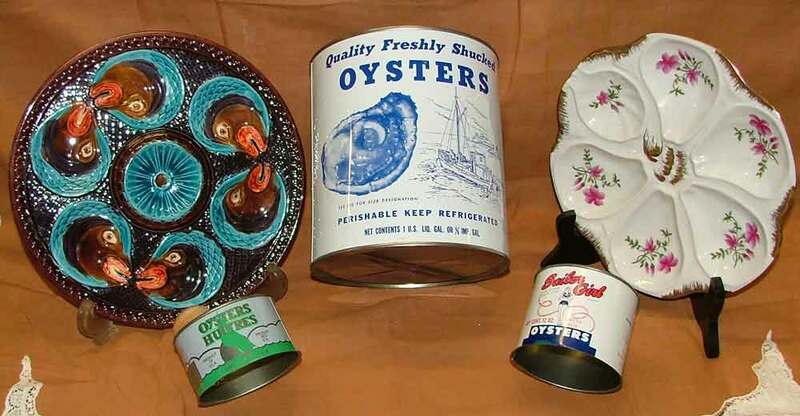 We also have several tins from oyster packing firms. These items are very collectible! 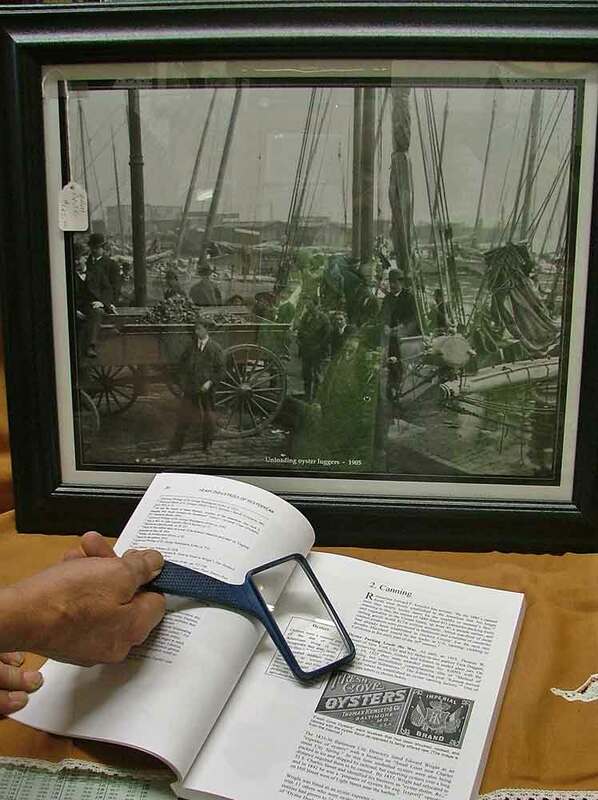 We also have this framed print “Unloading Oyster Luggers 1905” and the book Heavy Industries of Yester Year – Harford County’s Rural Heritage by Jack Shagena Jr. and Henry C. Peden, Jr. This book is available in our shop. Early French settlers designed small boats that would easily navigate the waters between ships and in Louisiana’s swamps. These boats were called French canots; they had a rounded bottom and a small fin that allowed them to go in shallow water. They became popular fishing boats and then oyster boats. These canots eventually became known everywhere as New Orleans Oyster Luggers. 500 B.C. : The earliest evidence of oyster harvesting — shell deposits called middens — indicate that people living in the Chesapeake region were eating oysters and other shellfish as long as early as 2,500 B.C. 1600s: Early colonial settlers frequently remark on the size and quantity of oysters in the Chesapeake Bay. Oysters were likely harvested using boats, rakes and by wading into shallow water to simply gather them. Yes, we have quite a variety of ideas in our 44 Days of Gift Giving. So come on in and visit us, we’ll be watchin’ for ya! 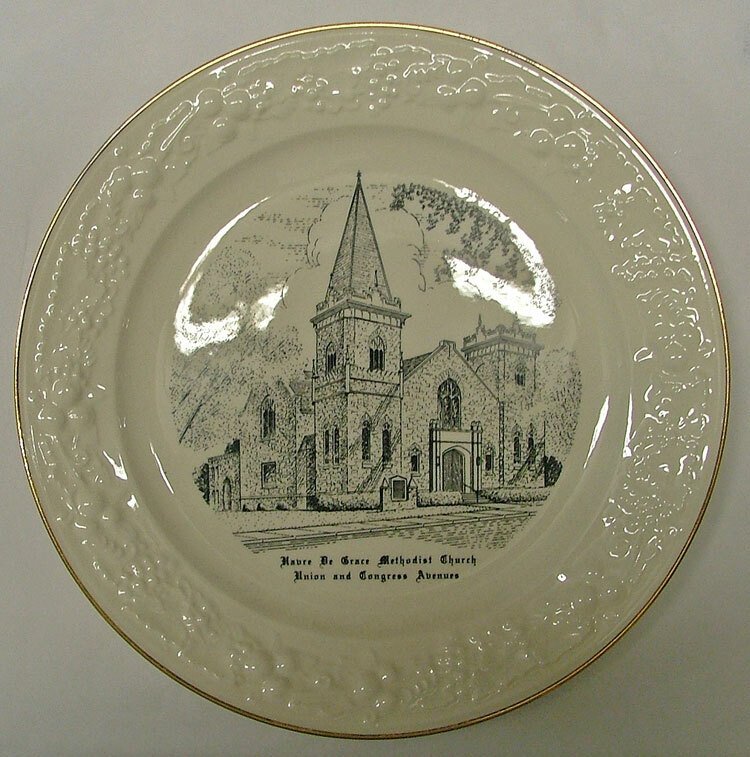 We KNOW there are folks on your list who would truly appreciate a gift from our Havre de Grace Collectibles. 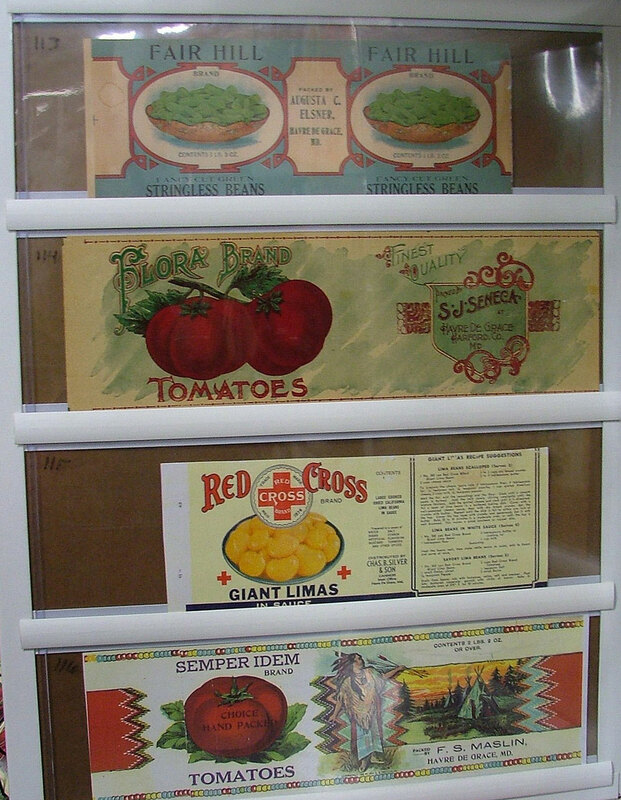 We have a variety of canning labels which, by the way, make great decorating for the kitchen! 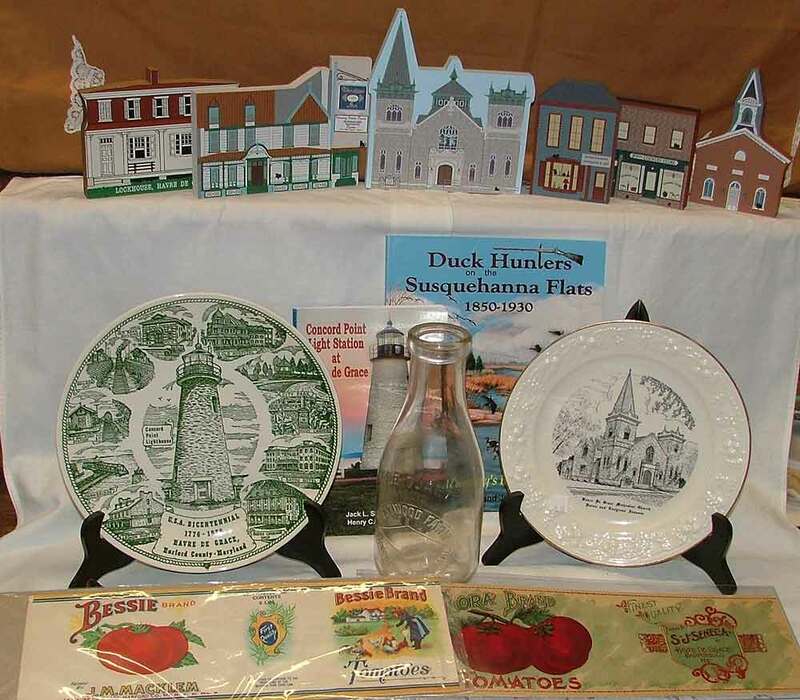 Above is also a milk bottle from Westwood Farm and two commemorative plates – one from the US Bi-Centennial and the other the Havre de Grace United Methodist Church. 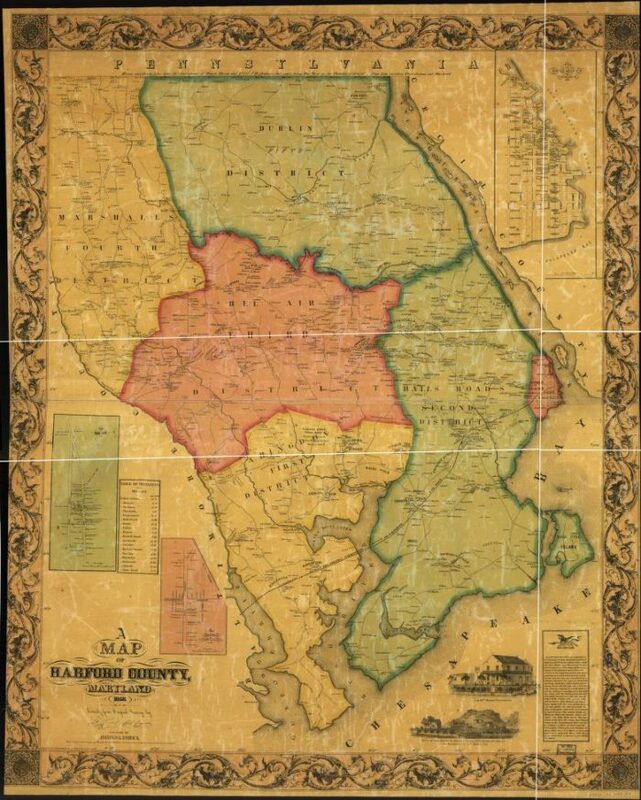 We have a nice variety of history books for Havre de Grace and Harford County to choose from. The collector items at the top would make great pieces to add to your holiday decorations – tucked in greens and candles for a buffet table or mantle piece. Lots more ideas await at Bahoukas. Stop in soon… the 44 Days of Gift Giving is counting down… we’ll be watchin’ for ya! 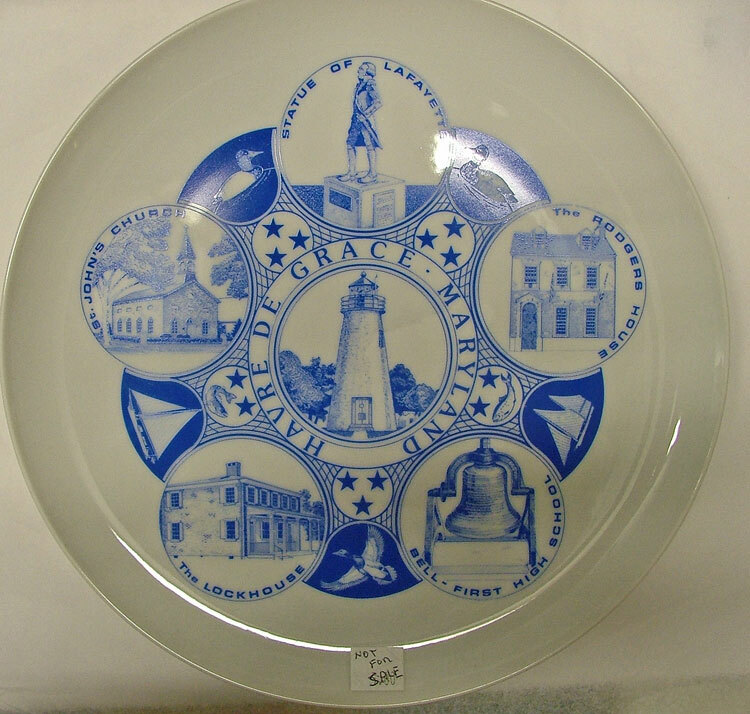 Stop by Bahoukas Antique Mall to view many historic pieces related to Havre de Grace history. Many are not for sale, but George has plenty of stories to make it worth your while. Of course, we have 9,000 sq ft of antiques and collectibles plus another 2,200 sq ft of browsing in the Beer MuZeum (and yes, most of this IS for sale). We’ll be watchin’ for ya! Having just enjoyed our 2017 Havre de Grace Independence Celebration, it seems like the perfect time to share some volunteer community activities of years past. Check out these programs from entertaining events! This 1930s brochure is delightful. Lots of local talent… and the layout is very interesting. On each page is an ‘act’ along with advertising. 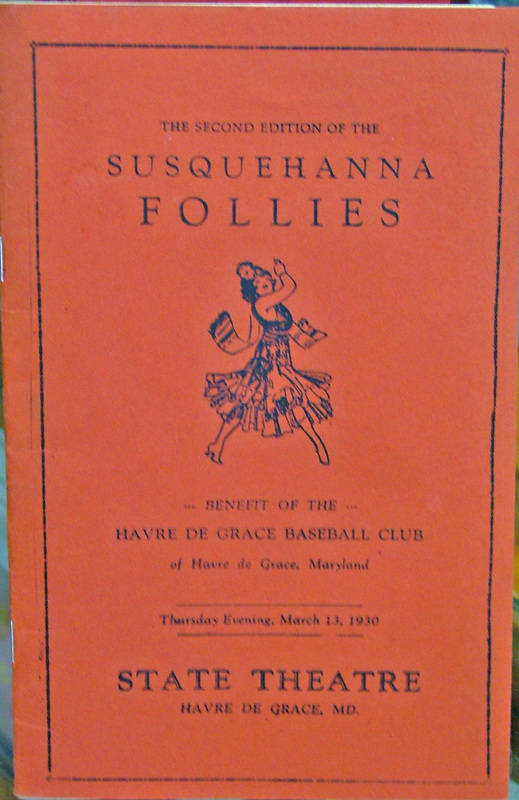 You won’t miss anyone – advertising support, sponsors, or participants in the ‘follies!’ This would be so much fun today! Look at the participation! We love these examples of community involvement and the great talent available. Stop by to check out these intriguing pamphlets and the many other historical pieces that can be seen at Bahoukas Antique Mall. In 1991 the United Methodist Church Celebrated 200 years! 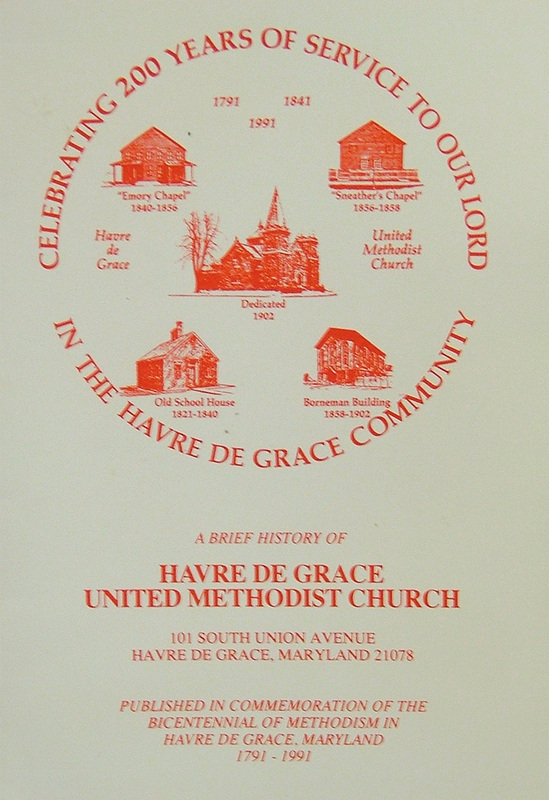 Havre de Grace UMC has a long history! I believe that the church first operated from the preacher’s home. 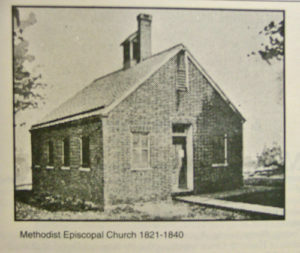 This is the first building where the congregation met. We’re double checking. But I believe the Susquehanna Hose Company firehouse at the corner of Union and Pennington Avenue is where the building stood. Supposedly, part of the wall was incorporated in the firehouse structure. We’re trying to find out if you can see it. What a wonderful history. And this booklet tells a very complete story. You are encouraged to learn more on their website. Better yet, please visit! It’s a beautiful building located at 101 South Union Avenue since 1902! In Stanley M. Barrett and Elias W. Kidwiler’s book, History of Havre de Grace – “The Town We Live In”, we learn of Palmer’s Island, later known as Watson’s Island, and now know as Garrett’s Island. … Then we read of Harmers Town, sold to Stockett, “after 1700 it was known officially as “The Susquehanna Lower Ferry.” In 1714 it again changed hands (ownership) to John Stokes. According to Kidwiler’s writings, In 1785 the Susquehanna Lower Ferry was incorporated as a town with a commission form of government and was officially given its present name (Havre de Grace). 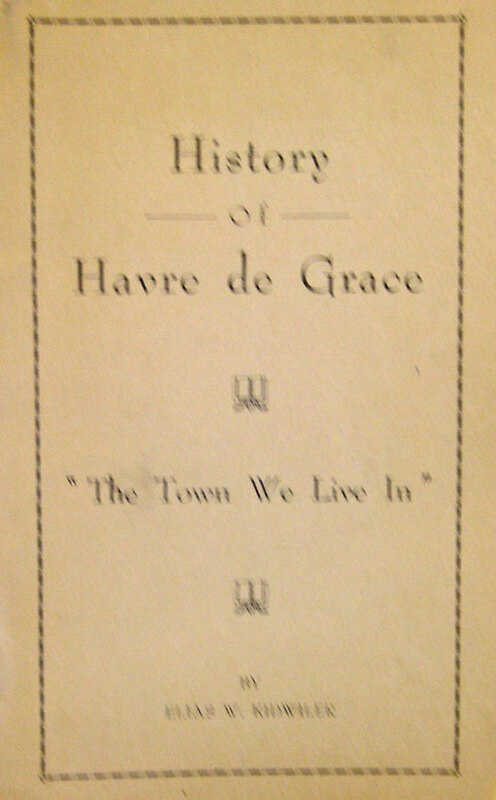 Havre de Grace, from the date of its incorporation as a town, continued to grow steadily in population and wealth. Fishing was the source of income for many of its citizens. The inns and hotels required the services of a considerable number of people. During the long, hard winters when the river froze to a depth of eighteen inches or more, many men were engaged in cutting, storing and shipping ice. 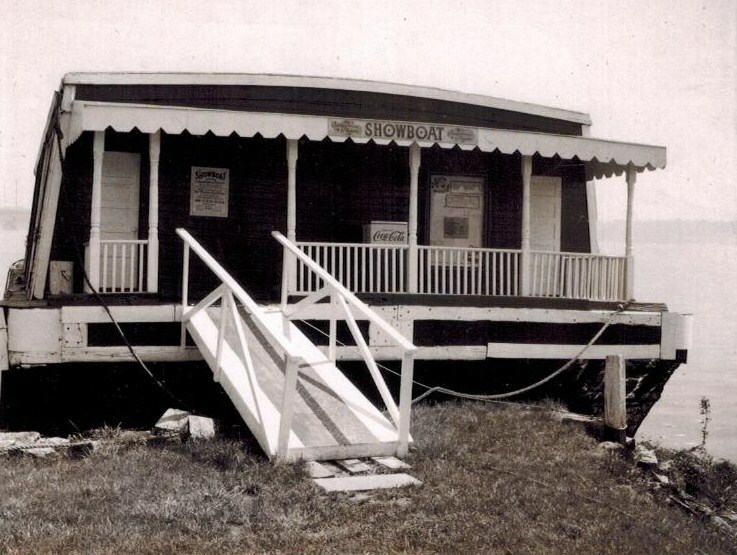 There were services necessary for the farmers who made Havre de Grace their shopping center – blacksmith shops, wagon factories and repair shops, feed stores, general stores and hardware stores. Canneries were built in the city and provided an outlet for more corn and tomatoes than the farmers had been formerly disposing of, and took a considerable portion of the local fishermen’s catch. The coming of the railroad meant employment for both skilled and unskilled labor. 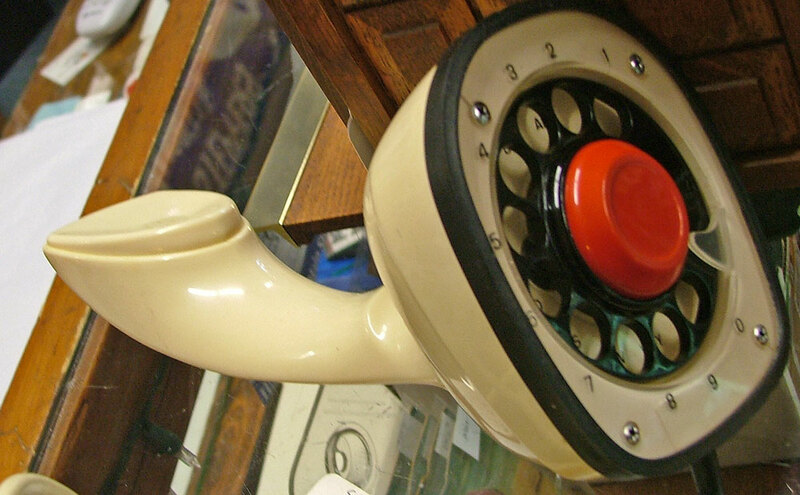 Again – apologies for the blur… We have duplicates of some of the historic items in the store; many we do not. Stop in and see these for yourself. Interesting perspectives of our community over the years. 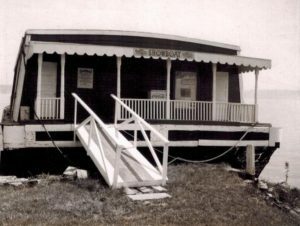 This brief history of the city of Havre de Grace has been compiled by the ladies of the Library Committee, and is offered to the public on the occasion of the second anniversary of the opening of the Havre de Grace Public Library. 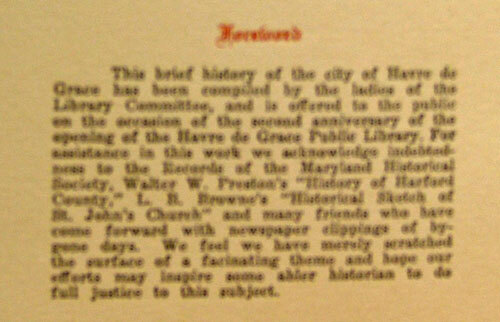 For assistance in this work we acknowledge indebtedness to the Records of the Maryland Historical Society, Walter W. Preston’s “History of Harford County,” L. B. Browne’s “Historical Sketch of St. John’s Church” and many friends who have come forward with newspaper clippings of bygone days. We feel we have merely scratched the surface of a fascinating theme and hope our efforts may inspire some abler historian to do full justice to this subject. We have endeavored to picture for you the growth and development of our city from its early beginning. First, a family or two, then, a cluster of houses sheltering an intrepid band which decided to seek no further. A few survived the early hardships, and the call of kindred inspired others to come. What makes a city grow? Is it not the spirit of its people, their desire to make their surroundings safe and attractive and the measure of their neighborly kindness which influences others to join with them for mutual welfare? A man is not attracted to a town where his best efforts will bring him no reward and his friendly advances are repulsed. 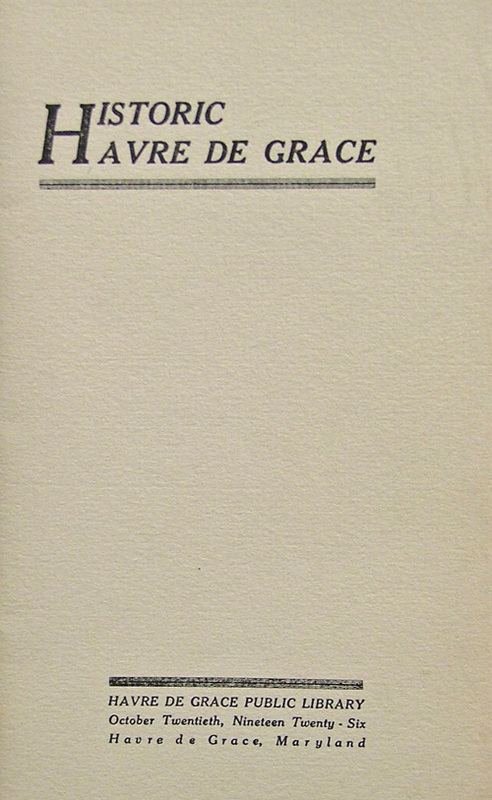 The spirit of enterprise and brotherly helpfulness is the great wellspring of a city’s progress, and this spirit in an increased measure is our desire for Havre de Grace. There is much wisdom for us in the 21st century from the perspective presented in these books and pamplets of yesteryear! 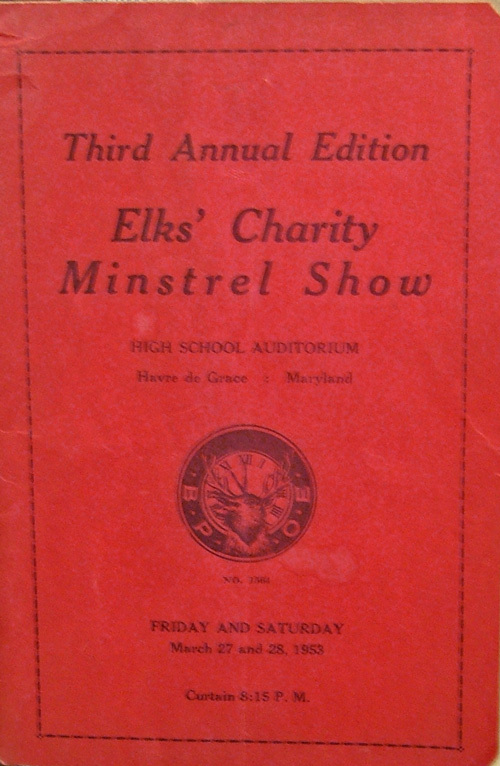 As the school year comes to a close, we wanted to share this interesting booklet from the 1950s. 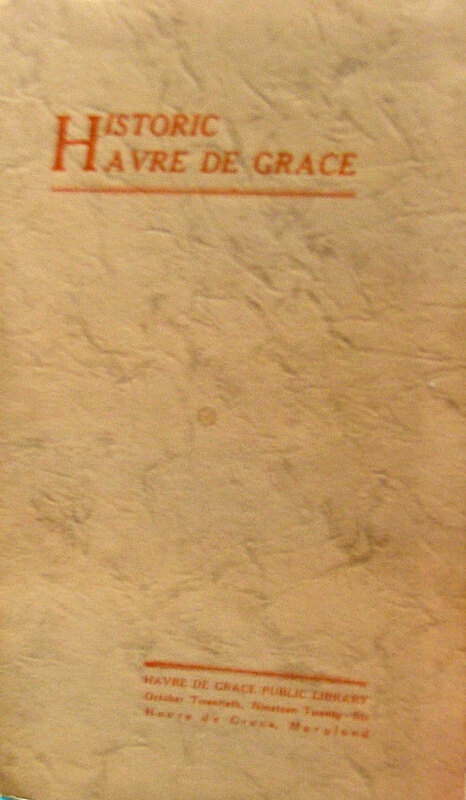 It’s a handbook for Havre de Grace Jr.-Sr. High School. 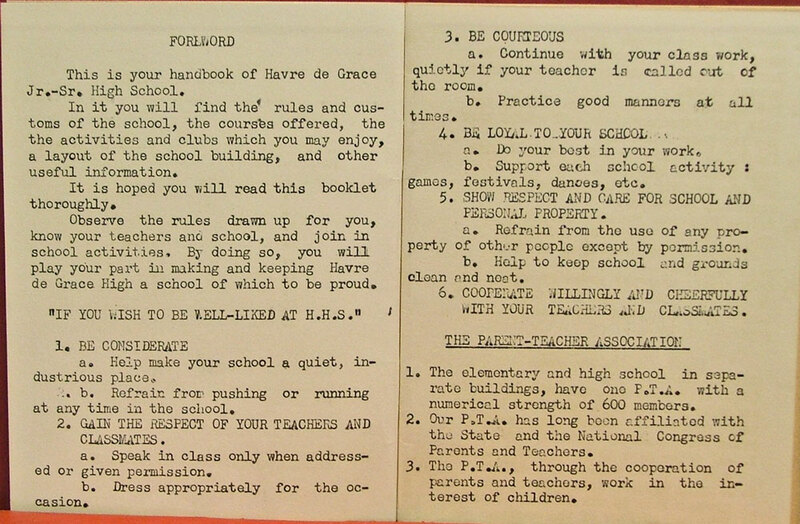 It explains “If you wish to be well-liked… “, information regarding the Parent-Teacher Association (membership of 600! ), and the rules regarding behavior, tardiness, etc. along with the results of breaking these rules. Do you remember these rules? Were they enforced? Stop in and take a peek. George has it at the counter! He’d love to hear your stories! 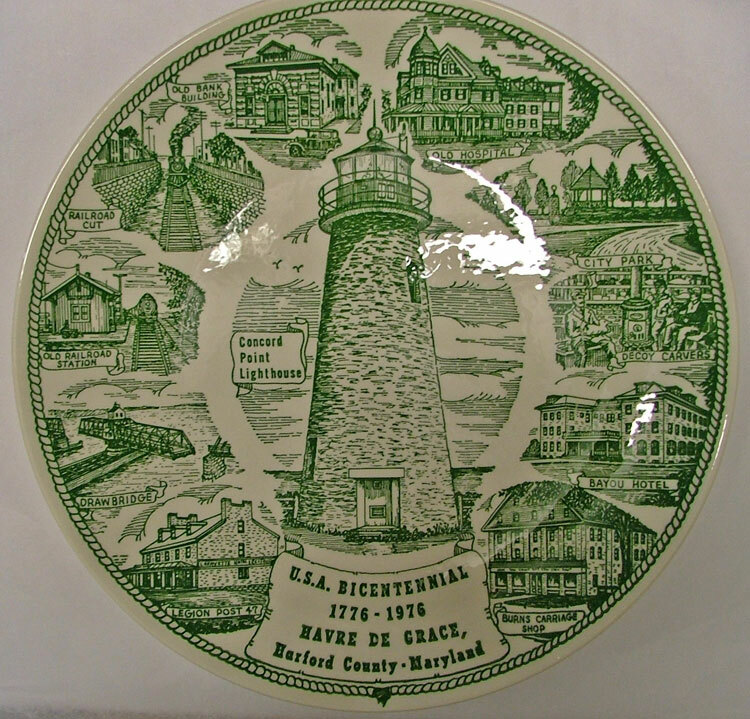 The above plate highlights our Concord Point Lighthouse, The Lafayette Statue, Rodgers House, the bell at our First High School, The Lockhouse (Susquehanna Museum), and St. John’s Church (presently being restored). 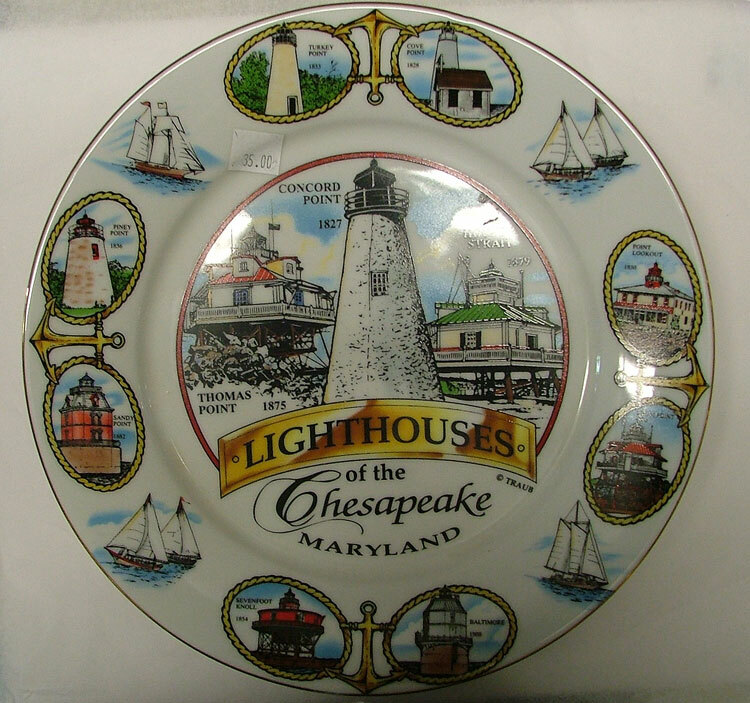 This popular plate showcases the Lighthouses of the Chesapeake, Maryland. 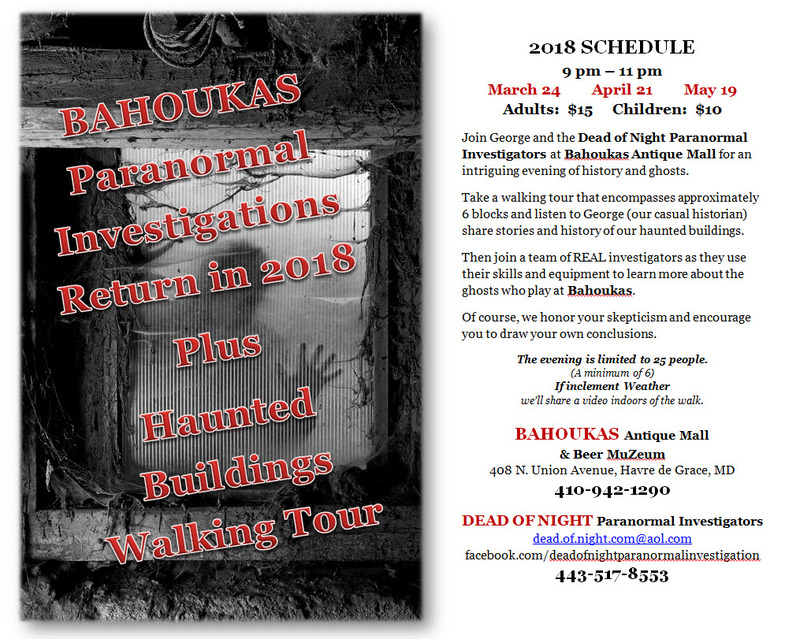 Visit BAHOUKAS Antique Mall and Beer MuZeum Soon! There’s always something interesting! 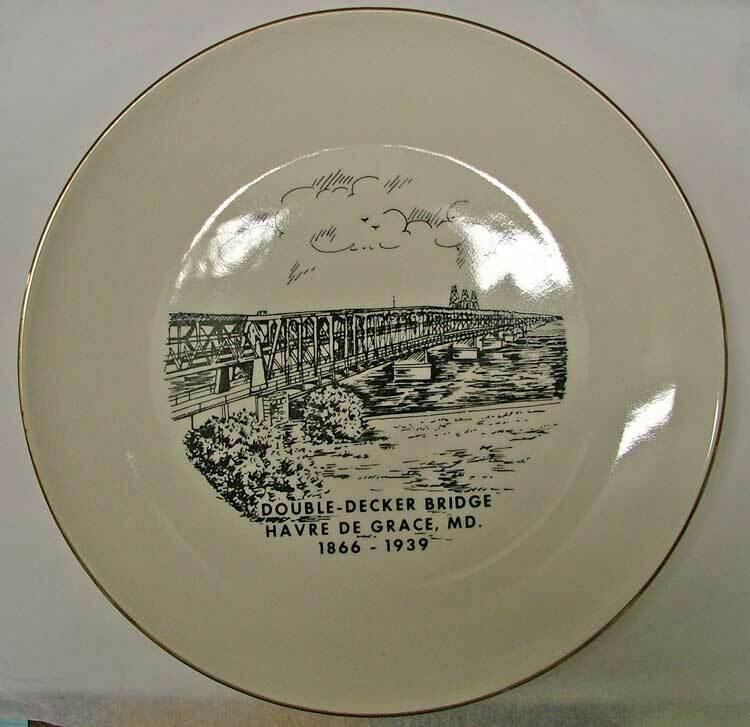 This wonderful plate commemorates the Havre de Grace Double Decker Bridge! give us a glimpse of the economics of earlier times. 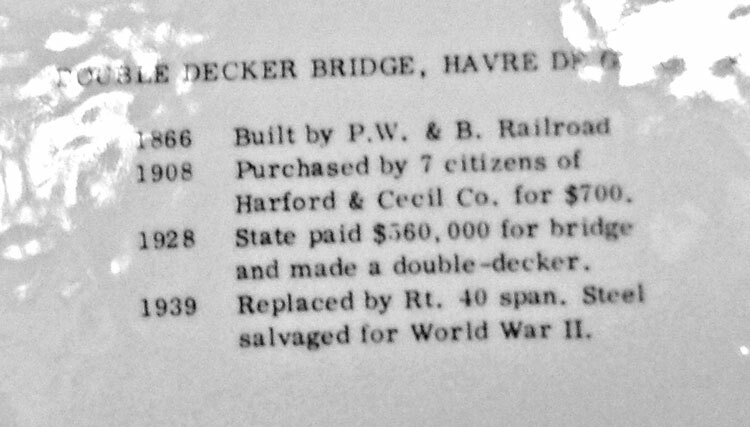 Does anyone know who the 7 citizens were that purchased the bridge for $700 in 1908? Fascinating! 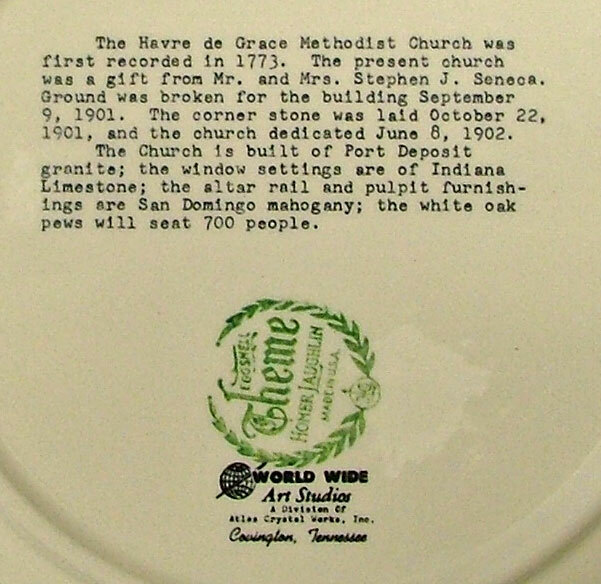 Another interesting commemorative plate features the Havre de Grace Methodist Church. 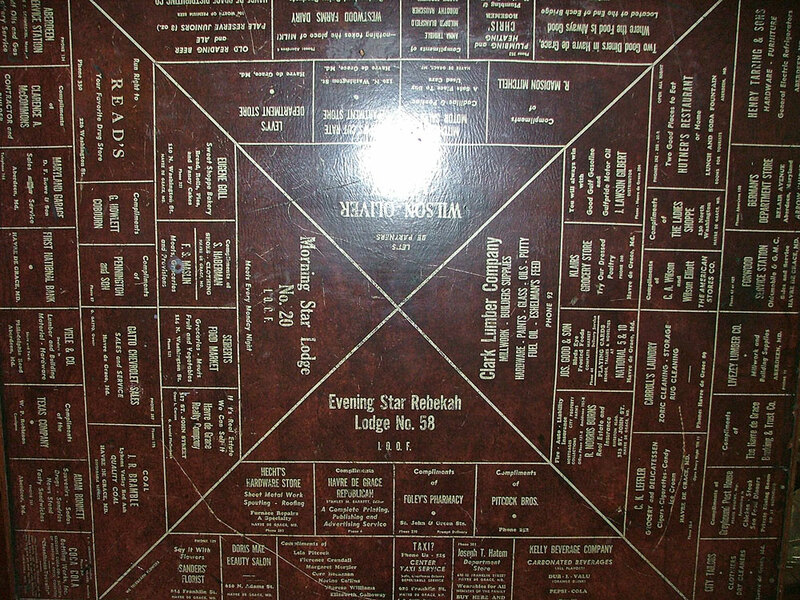 more information about the Methodist Church. Where was the church located before this building went up? Was it on the same corner? Or somewhere else? 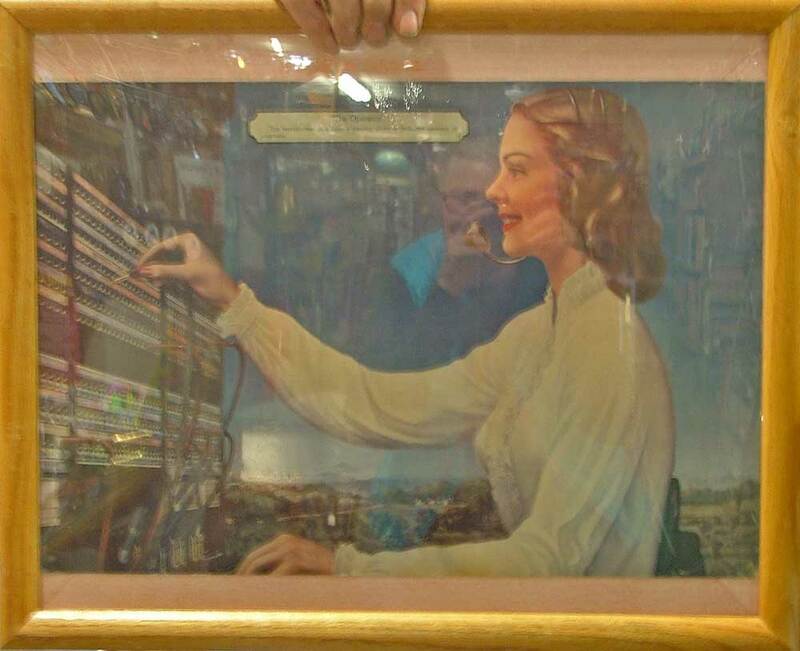 When you’re looking for collectibles, be sure to check out the back, underside, inside the lid, etc. 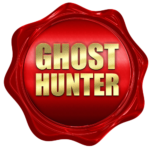 for interesting details that can often be found regarding the item. 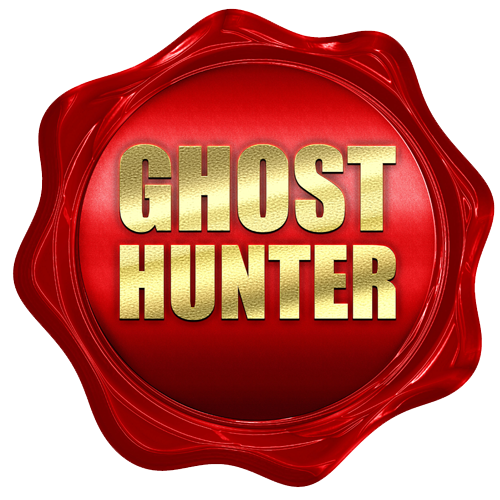 Be sure to stop in and chat with George at Bahoukas Antique Mall and Beer MuZeum. There’s always something interesting happening there! 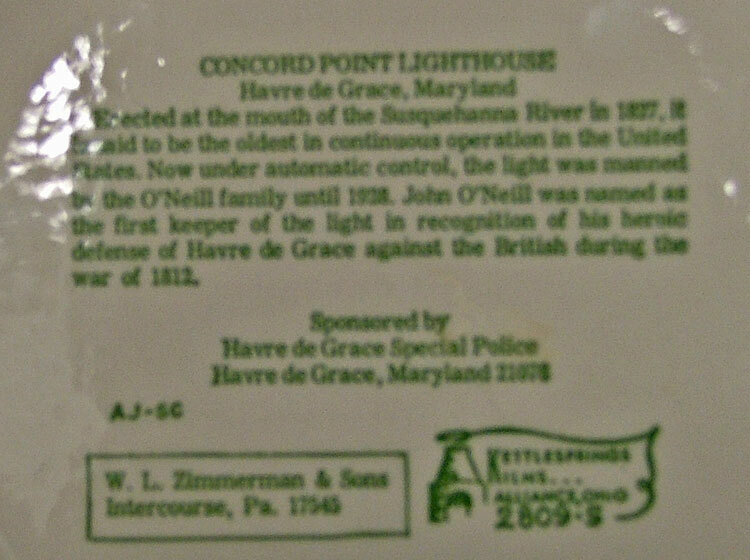 This is a great piece of Havre de Grace history! Apologies for the glare. 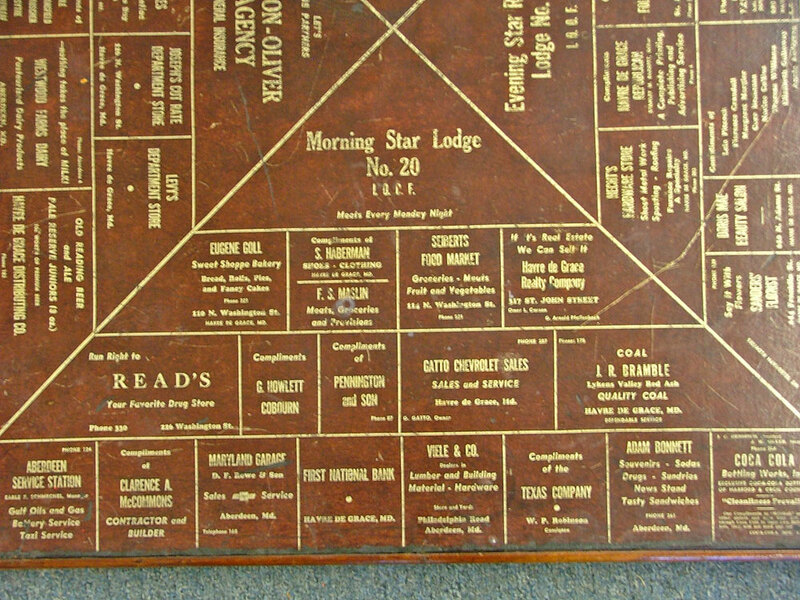 But this is an amazing piece of our local history. 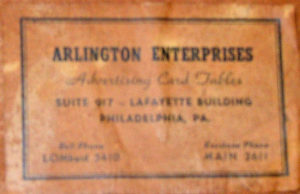 There are shops and businesses of all kinds on this 1940s advertising card table. 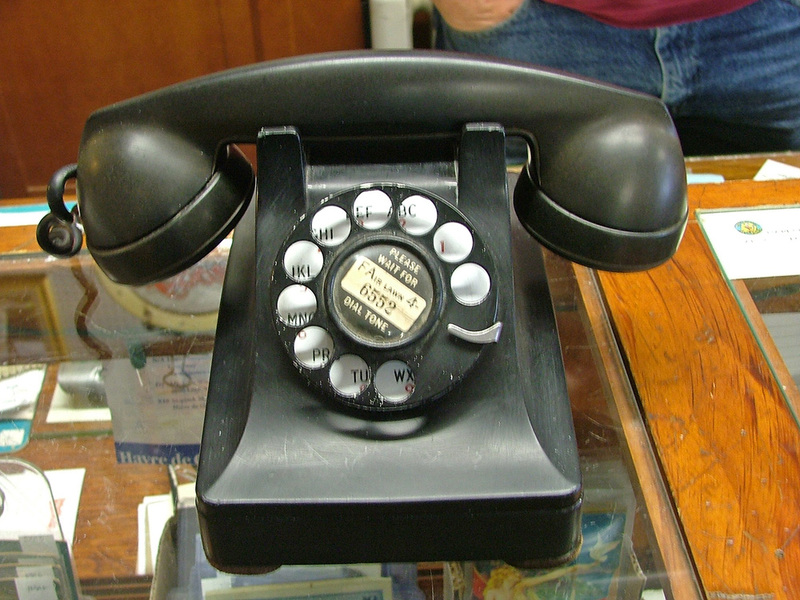 You’ll definitely want to stop in at Bahoukas Antiques and take a peek. I’ll bet many locals have their families’ businesses listed here! There are many that were new to us! WOW! 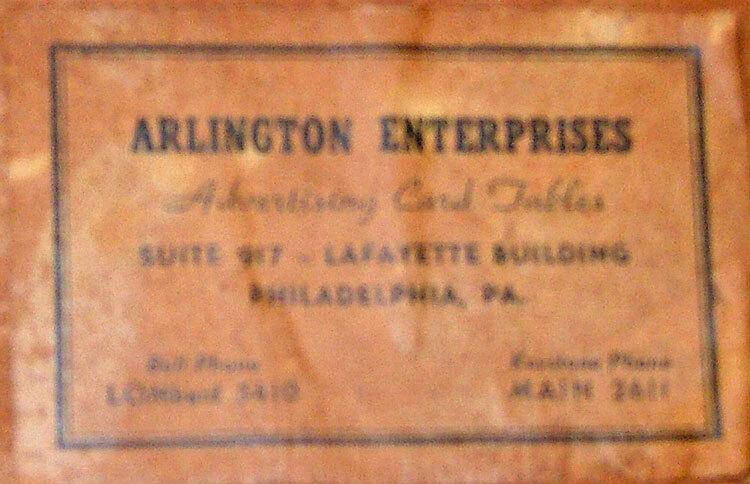 This photo to the left is the label on the underside of the card table that gives the name and address of the advertising company. 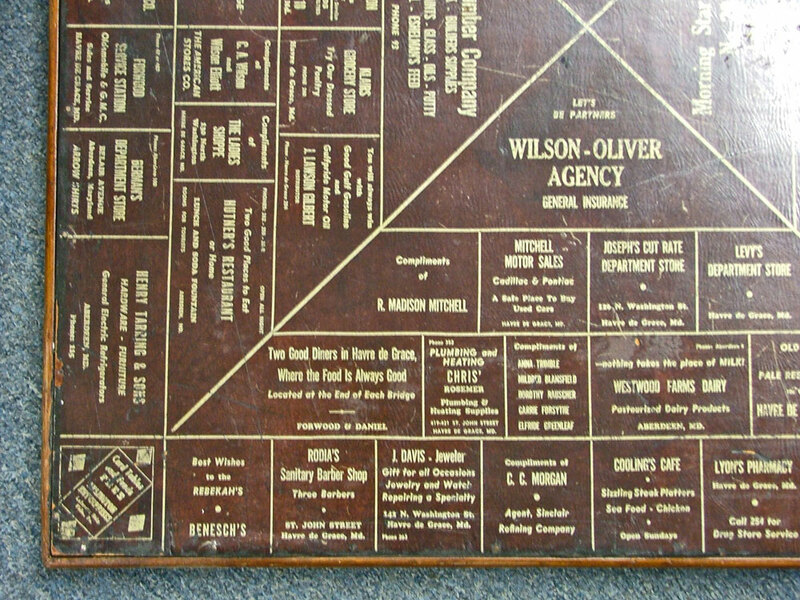 Below are a few close up shots of different sections so that you might read a number of the businesses that are printed on it. This is truly an remarkable piece. It’s most interesting where you might find research for your history project! Stop in and take a peek. If you have a story to share, be sure to chat with George! 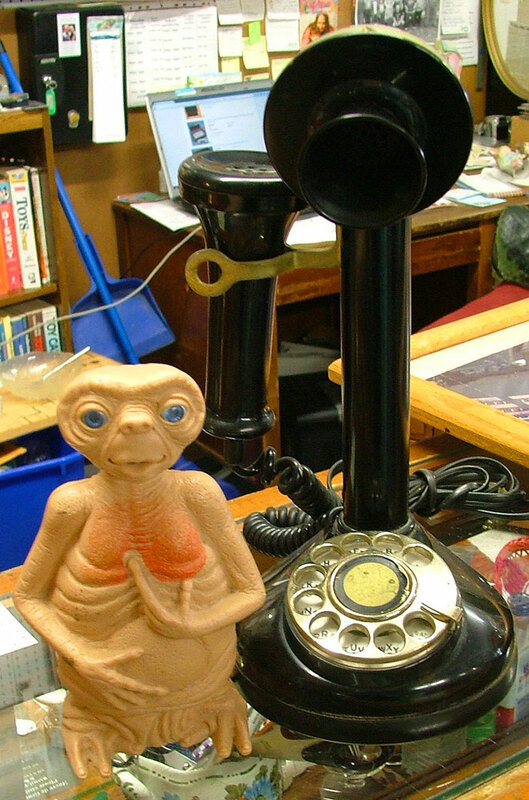 When Was The Last Time You Phoned Home! Jimmy told George years ago that his mom was a switchboard operator and the service was located on the 2nd floor of the old Post Office Building (where JoRetro is located) on the corner of Franklin and Union. This is a beautiful phone. 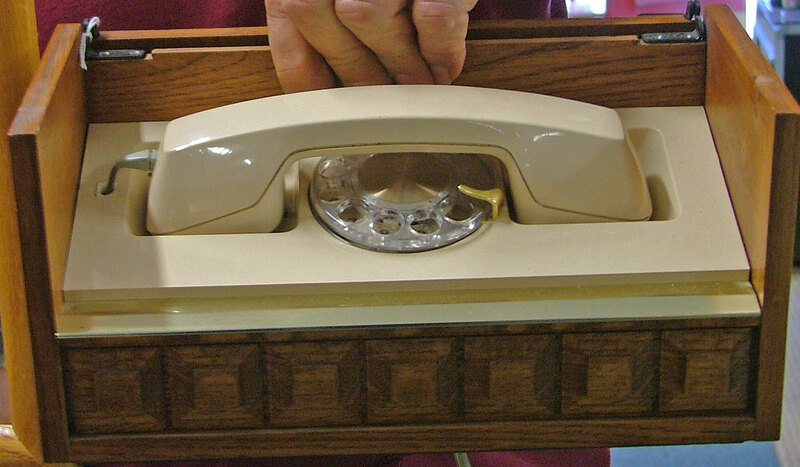 It’s a Western Electric “Stowaway” – it’s in a most beautiful wooden case and has a retractable cord on the phone. 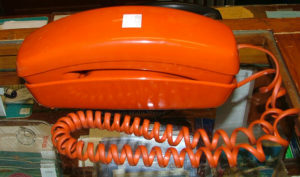 It’s from the 70s and talk about ‘stylish’! WOW! This piece is beautiful. You have to stop in and see it. Then check out this unique phone. It’s almost a piece of sculpture. 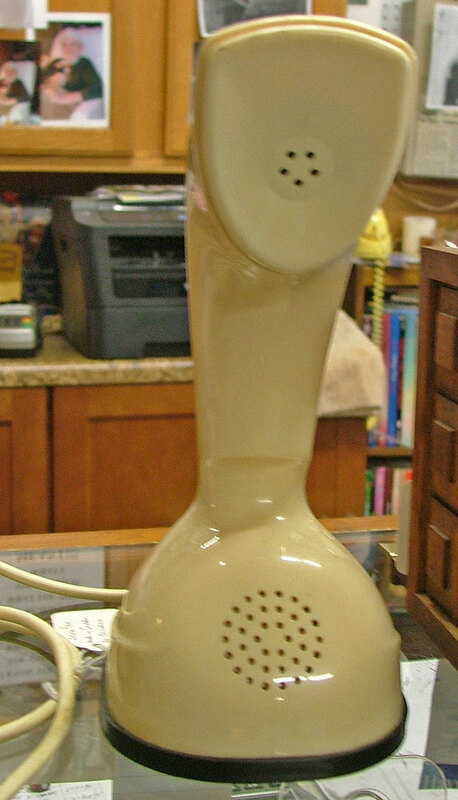 It’s an Ericsson, made in Sweden. 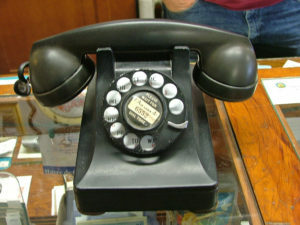 The dial pad is on the bottom. 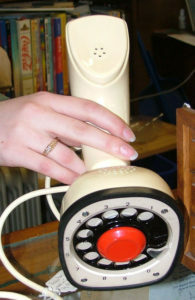 The next phones are a Bell System 1940s dial phone (on the left) and a Princess Style Phone from the 70s on the right. 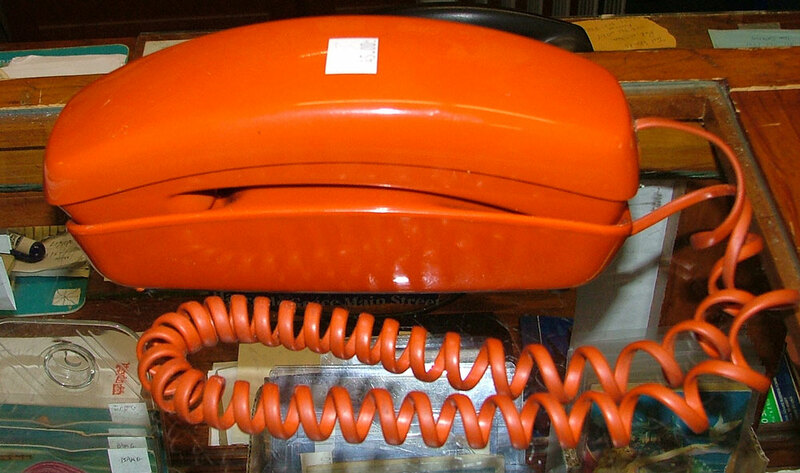 The color of the Princess Phone is rare. 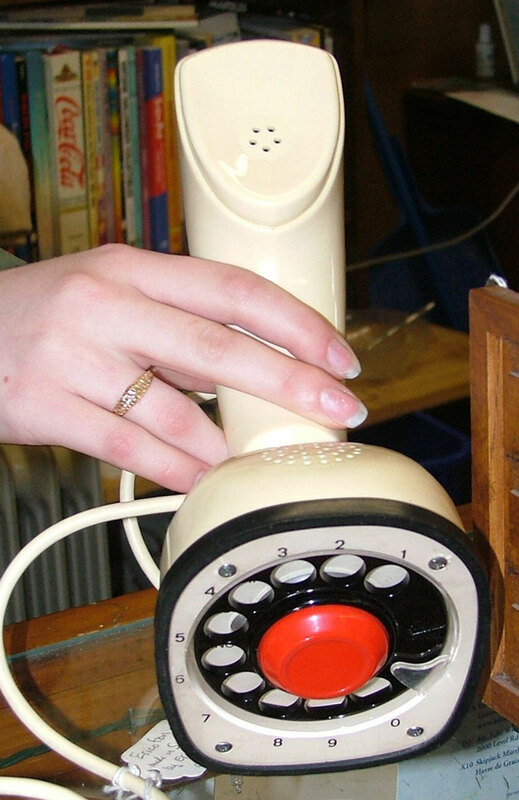 Of course, we can’t ignore the wonderful working reproduction of the Candlestick phone with dial pad. And we encourage you to “Phone Home” just like E.T. Did you know about the switchboard operator that worked on the 2nd floor of the old Post Office building? Anyone in cyber-land have any stories to add? 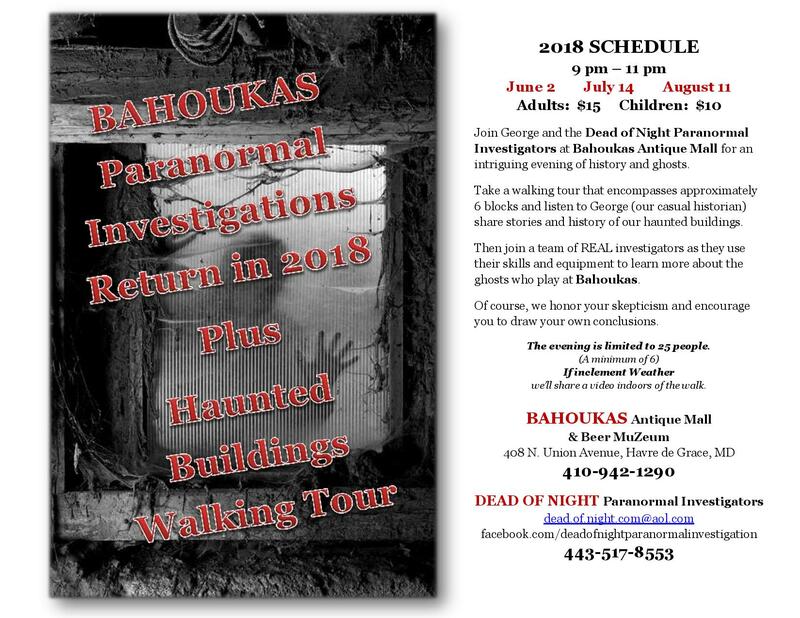 Stop in one day soon at Bahoukas and share your stories with George. 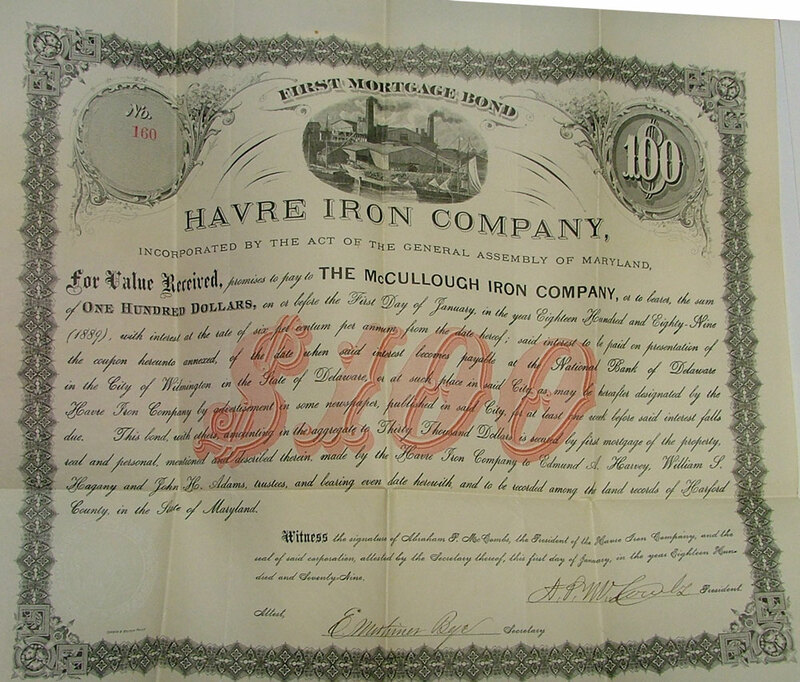 Entering the 20th century, Havre de Grace’s canning industry was thriving. CLICK HERE for a brief highlight of canning in Harford County. 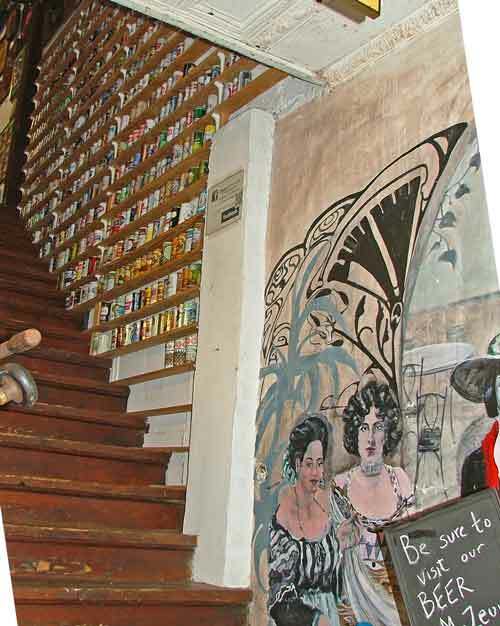 EXAMPLE of labels that can be seen in our shop at Bahoukas. Shortly after 1878, Stephen J. Seneca opened a fruit-packing factory in the S. J. Seneca Warehouse with a tin can factory next to Havre de Grace Waterfront. Seneca made improvements to canning with his patents; 1889 Can-soldering machine 1891 Can-soldering machine By 1899, Seneca had become a canned goods broker. Since the original railroad had run down St. Clair Street (now Pennington Ave.) to the river the location of the factory was advantageous for both water and rail shipping. Up until the Second World War many farmers in Harford County brought their produce to the Seneca Factory later run as Stockhams Cannery. S.J. Seneca lived at 200 North Union Ave. was Mayor of Havre de Grace 1893-1894 and donated the Methodist Church. The Seneca cannery, which is currently in use as an antique shop, is a very good example of a late 19th century brick industrial building. with its severally classical facade and massive stone buttresses on the rear. 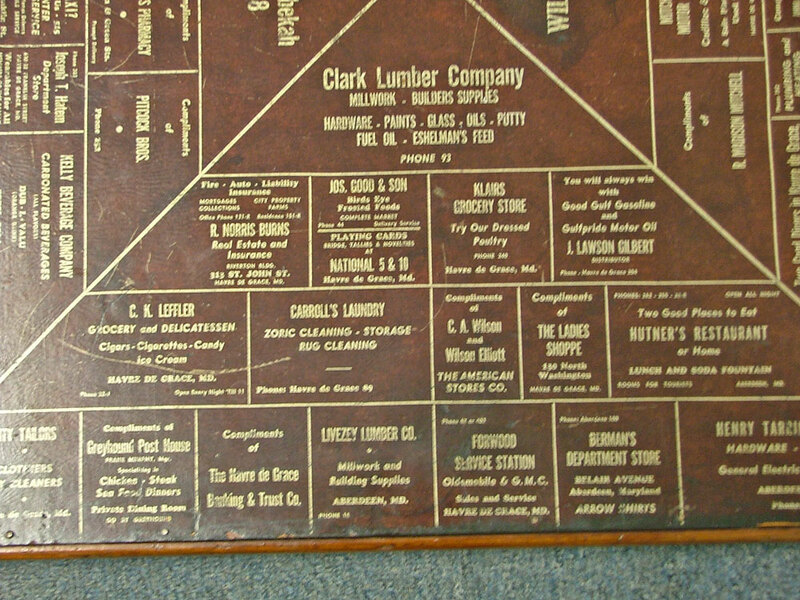 Here’s another photo of area labels of the once, very profitable canning industry in Havre de Grace and surrounding areas. Many patents followed the opening of the S. J. Seneca Cannery. 1901 The Baling-press. 1905 The Cooker 1905 The Tomato-scalder. 1917 Improved Tomato-scalder. 1917 The Can-opener. 1918 The Machine for peeling tomatoes. Spencer-Silver Mansion, now a B&B, located at 200 S. Union Avenue, is an example of the wealth in Havre de Grace in the early 20th century. You may also want to visit the Steppingstone Museum located within the Susquehanna State Park, at 461 Quaker Bottom Road, Havre de Grace. 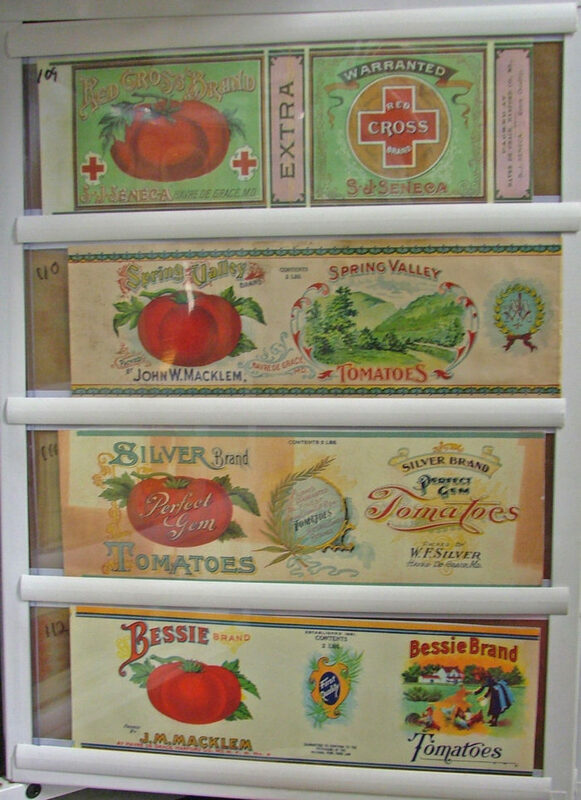 They have excellent exhibits of our rural history, including a great deal about our canning industry. 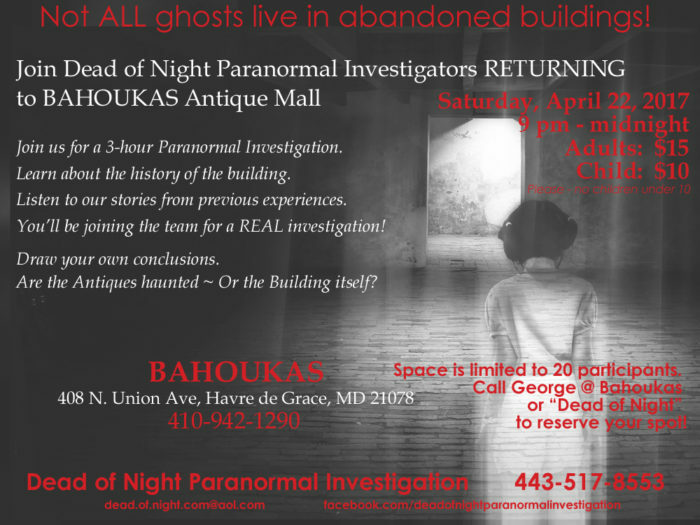 Be sure to stop in to Bahoukas for more history of Havre de Grace and they’ll eagerly give you directions to other locations in Havre de Grace to learn more. 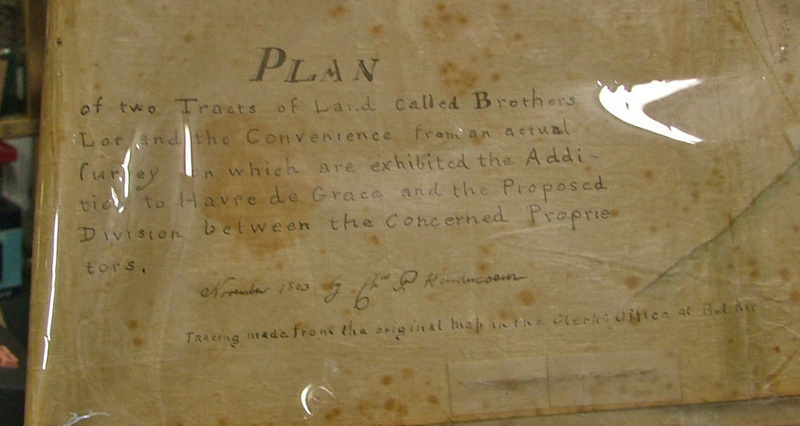 This bond was signed on January 1, 1879. The following are the signatures of A.P. McCombs, President, and the Secretary, E. Mortimer Bye. 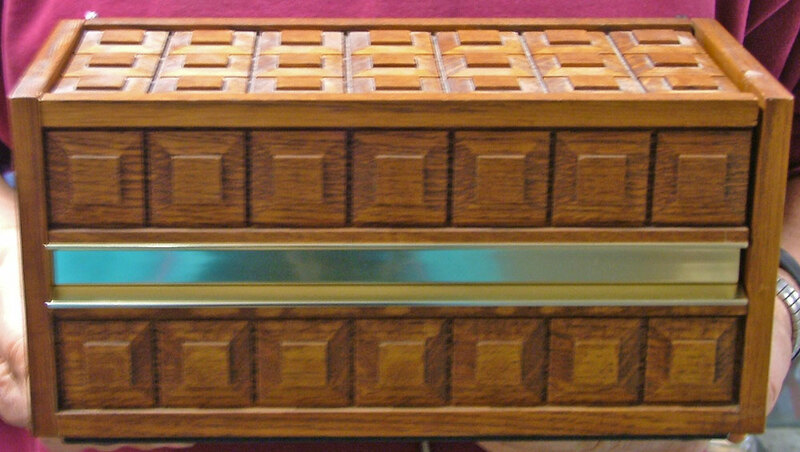 These items can be seen at Bahoukas Antique Mall and Beer MuZeum. A.P. McCombs built the grand Victorian Home located at 120 S. Union Avenue in Havre de Grace. This beautiful home is well-known in the area as “The Pink House.” You won’t miss it! Click the link below to read the pdf and learn more about this building from the Maryland Historic Trust document with photos. Needless to say, A.P. McCombs left a legacy in Havre de Grace. 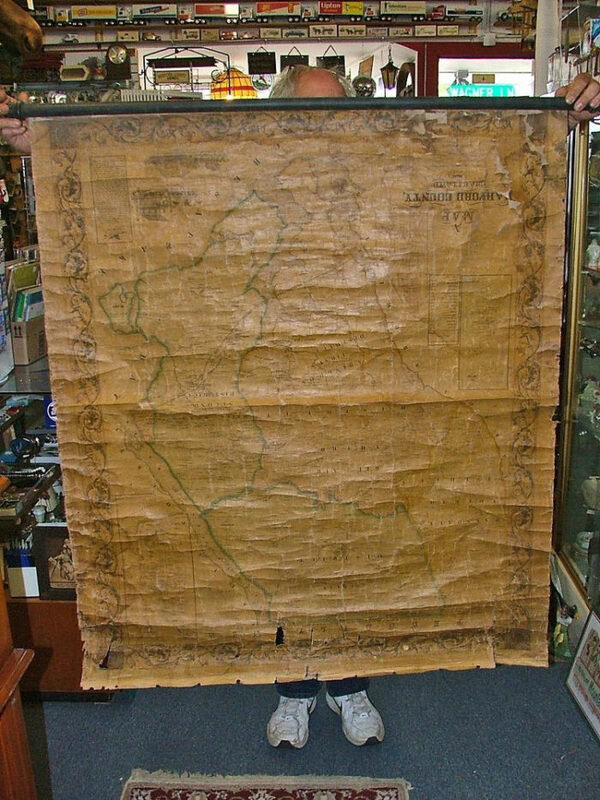 Stop in and chat with George, he’s a wealth of information and the most interesting tidbits about Havre de Grace!